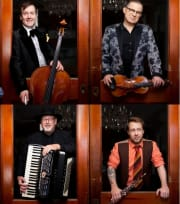 Virtuosic show pieces, romantic tenor arias, pyrotechnical solos, blazing gypsy show pieces, multi- instrument mastery and a World Accordion Champion - this Quartetto Gelato, a popular and highly unusual classical quartet. With sold out- performances in New York, Washington, L.A., London, Tokyo, Hong Kong, and elsewhere, this dazzling ensemble has enchanted audiences and critics worldwide with its exotic blend of musical virtuosity, artistic passion and humor. Classical in training, eclectic by design, Quartetto Gelato not only thrills audiences with its multi - instrument mastery, but also offers the bonus of a brilliant operatic tenor. With a performance repertoire that spans the globe and includes classical masterworks, operatic arias, the sizzling energy of tangos gypsy and folk song, the group's theatrical stage presence and relaxed humor establish an intimate rapport with audiences worldwide.